Following a successful year-long field trial in Stockholm, Sweden, municipal operator Stokab has ordered an automated optical distribution frame (AODF) from Nexans. The AODF will provide remote controlled patching to support and improve Stokab’s service for broadcasters, which enables media companies to transmit high-bandwidth video and sound over optical fibre from almost 30 event locations in Stockholm to their studios. Stockholm-based start-up hub, SUP46, has effectively gained unlimited connectivity via a direct connection to the core of the Internet. 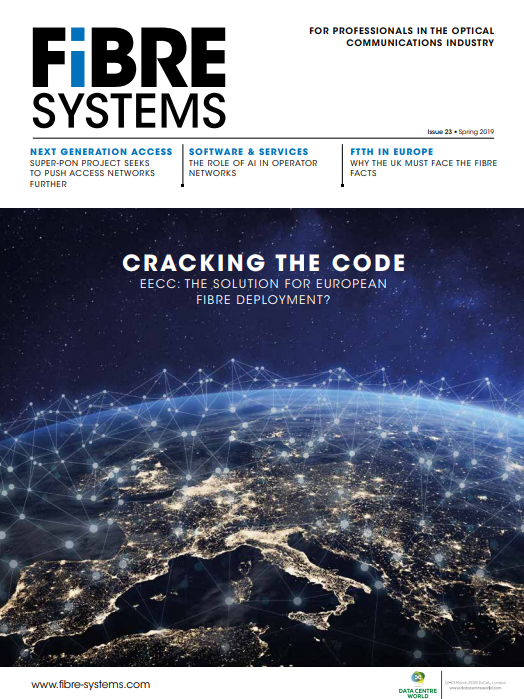 TeliaSonera International Carrier (TSIC), in collaboration with Cisco Systems, has connected the site directly to its global backbone with a staggering 100Gb/s. “We wanted to see what happens when you remove the limits on innovation,” said Brendan Ives, CEO TeliaSonera International Carrier. Estonian operator Telia Eesti, part of the Scandinavian group TeliaSonera, has deployed the ADVA FSP 3000 with 100Gb/s core technology in its national backbone network. One of the largest telecommunication providers in the Baltic states, Telia Eesti is using the ADVA FSP 3000 platform, complete with multi-degree reconfigurable optical add-drop multiplexers (ROADMs), to link every major Estonian city in an ultra-high bandwidth long-haul network. NTT Communications, the international communications business of NTT Group, has added a new ultra-low-latency connectivity service between two of Asia’s premier stock exchanges, the Japan Exchange Group (JPX) and Singapore Exchange (SGX). This new connectivity service will offer the telecom industry’s lowest latency route for international leased lines between the two colocation facilities – with an unmatched latency of 63.5ms. Openreach, the infrastructure arm of BT Group, has deployed ADVA Optical Networking’s FSP 150 platform as the foundation of its new 10G Ethernet Access Direct (EAD) service. The 10G service, which launched on 21 September, will provide Openreach's enterprise customers with 10 times the bandwidth at a cost-effective price point, helping meet increased demand for point-to-point data connectivity between sites. The National Supercomputer Centre (NSCC) and Agency for Science, Technology and Research (A*STAR) in Singapore have deployed the Infinera Cloud Xpress, using 100 Gigabit Ethernet (GbE) to connect two data centres in the delightfully named Biopolis and Fusionopolis reseach campuses in Singapore. ER-Telecom, one of the three largest Internet and pay TV providers in Russia, has deployed Ekinops’ 360 optical system to provide 100G DWDM wavelengths over its nationwide network. Huawei Marine has won a contract to build the Cameroon-Brazil Cable System (CBCS), connecting Africa to Latin America. Cameroon government owned operator CamTel and China Unicom have invested in the project, while Telefónica will support the initiative by providing its international facilities and experience. Global Marine Systems, a specialist in subsea cabling and engineering projects, says it is nearing completion of a large fibre-optic installation project being undertaken in the Sea of Okhotsk, in the Russia. The project, commissioned by Huawei Marine Networks for Russian long-distance communications provider Rostelecom, requires the installation of cable from Magadan, the gateway to the Kolymer region at the northern end of the Okhotsk Sea, running south to Ohka at the northern point of Sakhalin Island, then east to the Kamkatcha Peninsula. Optus, an Australian service provider and a subsidiary of Singapore-based Singtel, has completed an upgrade to its inter-capital fibre network from Cairns to Perth – increasing overall capacity by a factor of ten to 100Gb/s per wavelength.